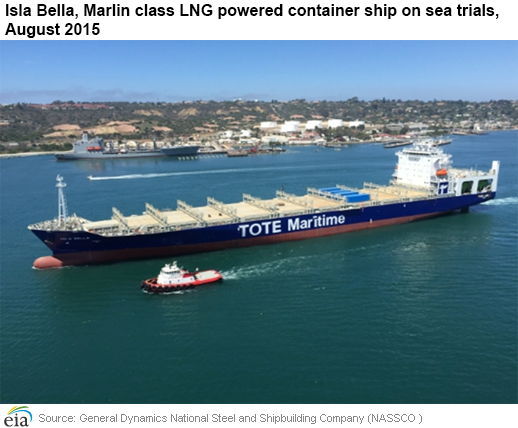 The General Dynamics shipyard in San Diego delivered the world’s first liquefied natural gas (LNG) powered containership to TOTE Maritime on October 16. The 764-foot long Isla Bella is the first of the Marlin class, a new class of container ship built in the United States, making it Jones Act-qualified for shipments between U.S. ports. The ship was built by the National Steel and Shipbuilding Company, a division of General Dynamics. Delivered nearly two months ahead of schedule, the Isla Bella will operate out of Jacksonville, Florida, providing service to and from San Juan, Puerto Rico. The second ship of the class, the Perla del Caribe, will be delivered in early 2016 and will service the same trade route. These ships join a small group of LNG-powered ships, which currently number fewer than 100, excluding LNG tankers, according to data from DNV GL Maritime. They are the first in the largest category of vessels–container ships, numbering in the tens-of-thousands–to be built with dual-fuel propulsion intent on employing LNG as the primary fuel. LNG-powered vessels directly support the global implementation of rules set by the International Maritime Organization in November 1973 through the International Convention for the Prevention of Pollution from Ships (MARPOL, or marine pollution) for reduced pollution by marine transport. MARPOL regulations, and amendments, have called for emission controls since 2012, and for even more stringent requirements in Emission Control Areas (ECA) that include coastal areas in North America and the Caribbean Sea, where TOTE Maritime operates. According to TOTE Maritime, the use of natural gas as the primary fuel for Marlin class vessels will reduce nitrogen oxides, sulfur oxides, and carbon dioxide emissions from these ships by more than 70% compared with the ships that they will replace. However, because LNG is not readily available today in most U.S. harbors, the challenge that must be met in order to make LNG a solution in meeting MARPOL regulations will be the development of a comprehensive LNG supply and distribution network for the marine market. To address this, TOTE has partnered with WesPac Midstream LLC, a LNG supplier, and its affiliate Clean Marine Energy LLC to build North America’s first LNG bunker (supply) barge to service TOTE’s LNG-fueled ships.